There was a time -- in the past now -- when young people were first discovering what a synthesizer was, when dance music combined with rock, when every sound acquired a visual element, when men began wearing earrings, when the concept of indie-rock was first developed... and things were totally awesome. 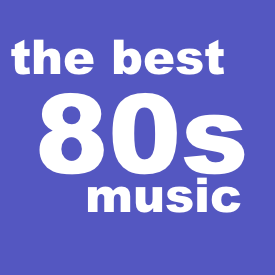 That time was the nineteen eighties, and these few pages are dedicated to the best 80s music. We'll be talking about songs and bands and what made them special, what made them unique, what made their music worthy of living on for those of us who are fans of songs of that decade. We'll be adding little bits of trivia along the way, as well as links to where you can find and download this great music. Now, it's quite possible that this list is very different from anybody else's similarly titled list, namely because we are interested in what we truly feel was the best music of the decade, not necessarily the most popular. Michael Jackson's Thriller may have been the biggest selling album of the 80s (or of forever for that matter), but you won't find any of those songs on the list. Nor will you find Journey or Hall & Oates or Whitney Houston or anybody else just because they sold tons of records. Which is not to say that all popular artists are banned from this list. The Police, for instance, sold enough records to bankroll a small country, but they were still very cool so they're here, but since their most popular song, Every Breath You Take is not remotely their best song, it is not on the list. Same for U2, as they have much better songs than their gagillion-selling With or Without You (which is not to say that it is a bad song, just that they have several others that are better). FREE listen!!! -- non-Hollywood audiobook! An indie audiobook of an indie novel about... indie folks! 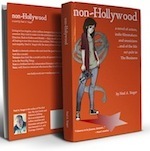 Have a FREE listen to the entire audiobook of the novel non-Hollywood... and share it! How do you make an audiobook in the most indie way possible? The audiobook for the novel non-Hollywood has been made in true indie fashion. Author Neal A. Yeager recruited actors from across the US to read chapters of the book. It's a natural fit, as the subject of the novel is... actors and indie film and music types. Listen to the audiobook for free right here on this site! Or purchase (or preview) the book at any of the usual online stores! Seattle (1987) by Public Image Ltd.